Download O&O Directory 2016 for FREE! NEW! Get the Excel format for only Php5,000.00! The best, most comprehensive directory for Information Technology (IT) and Business Process Outsourcing (BPO)/ Business Process Management (BPM) companies in the Philippines. Are you an IT or BPM (BPO) company? If you do not yet have a full-page profile in the directory, simply download the Info Sheet below and submit it to bpodirectory@asiatype.com by December 29, 2016. You will be included in the next issue. To update your existing full-page profile, you may request your last-submitted info sheet from Grace Orteza at bpodirectory@asiatype.com for easier updating, or send a newly filled-out info sheet. Submissions should be received by September 23, 2016. Want more visibility for your company? Download our Advertising Opportunities Kit. 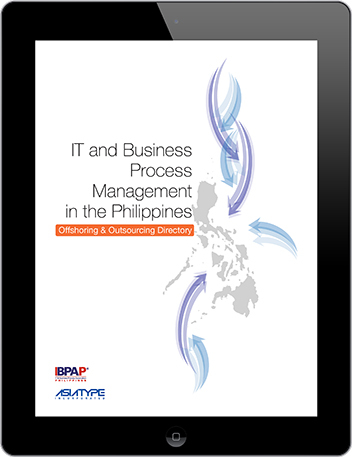 The Offshoring and Outsourcing Directory is a project of Asiatype, Inc. and the Information Technology and Business Process Association of the Philippines (IBPAP), with IBPAP's partner associations: Animation Council of the Philippines (ACPI), Contact Center Association of the Philippines (CCAP), Game Developers Association of the Philippines (GDAP), Global In-House Center Council Philippines (GICC), Healthcare Information Management Outsourcing Association of the Philippines (HIMOAP), and Philippine Software Industry Association (PSIA). First time to download? Please register here.